Head of Sinbad pictograph panel detail. 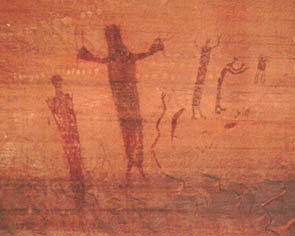 This page focuses on Barrier Canyon Style rock art west of the Green and Colorado Rivers and outside Canyonlands National Park. A concentration of Barrier Canyon Style art is found in the San Rafael Swell region. The Swell is a huge geologic blister, a 45 by 65 mile uplift. West on Interstate 70 from Green River, Utah, the traveler crosses the San Rafael River before encountering a long and steep upgrade cutting through a narrow canyon. This edge of the Swell is the San Rafael Reef. The road rises from near 4,000 feet elevation at the Green River to about 7,000 feet atop the swell. The traveler of this region is made aware of geologic vocabulary like "reef, an impassable barrier." Only a few narrow canyons pass through the 50 mile long reef of steep slopes, flatirons, hogbacks, overhangs, deep recesses, balanced rocks and a maze of otherworldly eroded forms. The landscape climbing the Swell is a transection of Mancos shale and formations named Dakota, Cedar Mountain, Morrison, Summerville, Curtis, Entrada, Carmel, Navajo, Kayenta, Wingate, Chinle and Moenkopi. Rising in elevation is a descent in geologic history. The oldest formations contain 235 million year old reptile tracks. Along the perimeter of the Swell tongues of durable Navajo Sandstone, the least erosive of the strata, rise into the air to form the backbone of the Reef. Pictographs are found on this enduring surface, in the overhangs and niches time, wind and water have created. Several sites are found in the vicinity of Goblin Valley State Park. These are located in the narrow canyons transecting the Reef. The best know of these is the Temple Mountain Wash panel, perhaps because it is near the roadway. Exfoliation has removed part of this unique pictograph. One large anthropomorph can be seen to hold a snake in its hand, another has a bug-eyed anthropomorph peering over the shoulder of a superimposed figure. Several animals are depicted. Nearby is a Fremont Style red paint anthropomorph. The images are about 40 feet high on the cliff. Black Dragon Canyon is located in the Reef just north of the freeway canyon. Some typical Barrier Canyon Style figures are found atop a talus. 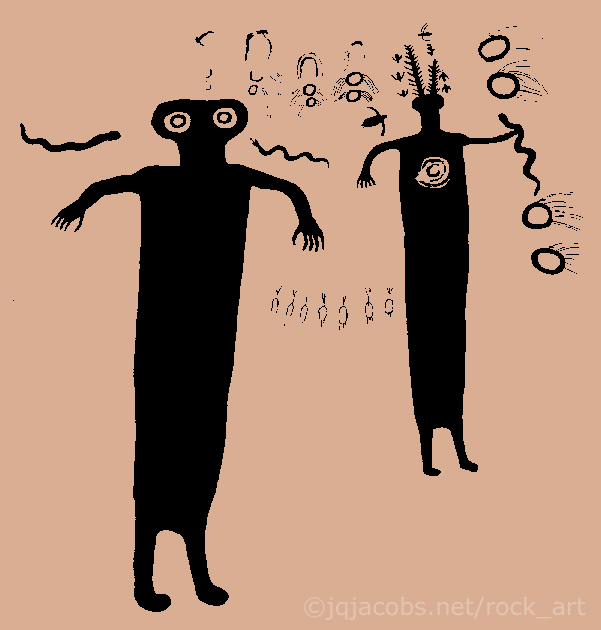 Nearby, in a recess, a totally unique rock art panel is found. It consists of groupings of dots, short lines, zigzags and bird tracks in a complex arrangement. The tallies reveal a predominance of even numbered groupings. This panel cannot be said to be of a known style. In the northern part of the San Rafael Swell, southwest of Cedar Mountain and southeast of Castle Dale, a deep canyon cuts through the uplifted formations. Buckhorn Wash contains several rock art sites, including a spectacular and large Barrier Canyon Style panel. The site is on the ancient Spanish Trail and has been much vandalized, particularly by early explorers and settlers of the region. The painted canvas, over 160 feet wide, enlivens the base of a towering, vast, sheer sandstone cliff. 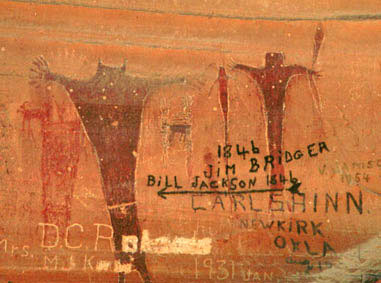 During my last visit the ancient pictography was bullet riddled and painted over with individual names, dates, and a group; AVON OVAN 1805, 1846 Jim Bridger Bill Jackson, William J. Powell Jr. 1884, CRC ARM. Since then a restoration has been performed. While most of the red painted figures are anthropomorphs, some are entirely unique. 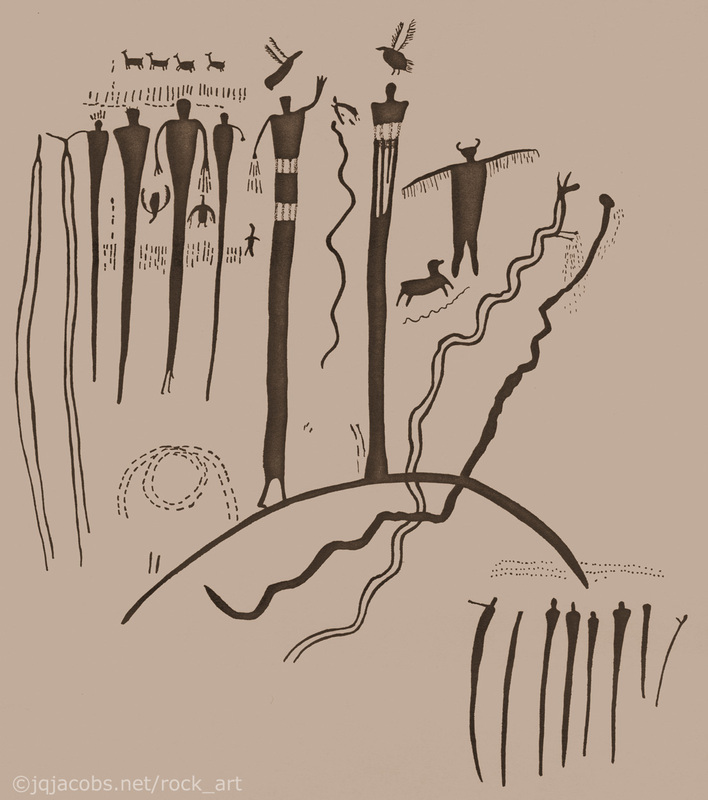 A small section of the panel illustrated above (black and white rendition) depicts anthropomorphs smaller in scale than the remainder of the site. The scale is again reduced in the detail in the lower right of this drawing. This use of three different scales of anthropomorph groups is unique at this site. Perhaps the diminutive figures at the end of the arc are an attempt at perspective, a depiction intended to convey the impression that they are off in the distance along the arc. Due to chalking it was very difficult to draw every detail with exactitude. Whoever chalked the figures may have intended to make them clearer on his or her personal photograph, however the chalking heavily damaged the panel. I have not visited the site since restoration. The two photos above and next two were taken before restoration. The white spots an the torsos are bullet holes. On the far right end of the panel is a field of dots. They were difficult to count with 100% assurance of an accurate tally. They number 260. Tallying seems part of this panel. The next photo is near the dot field. Note also the very faint dots in the photo. The number of fingers on many of the anthropomorphs does not correspond to human anatomy. Some of the digits extend into long lines, others are oversized or upraised. Several figures are holding snakes. Beyond the right end of the pictograph panel there is a petroglyph panel. It is quite old, as indicated by complete repatination. 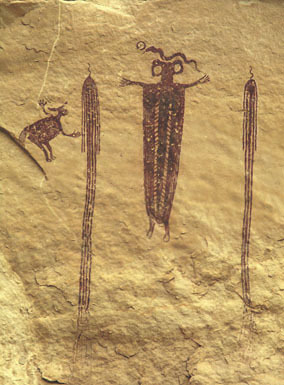 The figures include sheep or elk, one being quite large with complex antlers. One of the sheep? has a head on each end. An interesting feature of Buckhorn Wash is the slit window in the rock horizon down canyon, in a roughly southeast direction - the direction the panel faces. Move to the sides of the panel and the window closes. I have witnessed winter solstice sunrise at the panel and the window is south of that rise event. Such a window could be used to compare the azimuth angles of stars, perhaps by placing marks or images on the cliff. I found no rock art near the rock window. 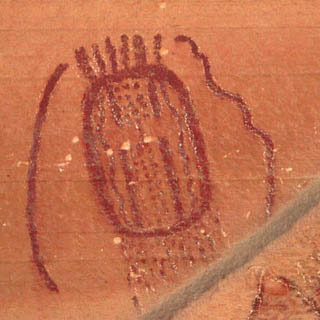 More rock art is found up canyon near a cave, including a Hopi Rain Clan symbol and an animal track at the cave entrance, some sheep nearby, and a fragment of red paint across canyon. Further up canyon is a chalked petroglyph panel, named the Cattleguard site after this nearby feature. It also has some small black paint figures of unknown style. A petroglyph panel is also located along the base of Cedar Mountain, on a large boulder at the base of the talus. Recent additions there include E=mc2, a depiction of an Olmec head and drawings of a railroad worker. No other Barrier Canyon Style sites are found up canyon. Others are found up river on the San Rafael River, in a side canyon above Buckhorn Wash. The Swell is a remote, uninhabited region. The only campground I know of within the Swell is located at the San Rafael River bridge near the mouth of Buckhorn Wash. It is remote and I have never seen anyone else camping there. From the Wash the dirt track south leads to the I-70 ranch exit, atop the Swell. Other smaller panels are found on top of the Swell. The best known are two cliff buddy panels known as the Head of Sinbad panels. 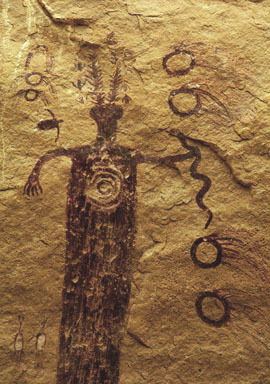 One has been termed the best preserved of the Barrier Canyon pictographs (the last photograph above). The other (the rendition below depicted) is to its left (view facing the panel). They are on a south facing cliff. The leftmost panel portion has been obscured by mud washing down the cliff. My drawing is therefore a partial view of the original scene. Several other Barrier Canyon Style panels are within a few miles of these, though they are less spectacular and have little detail. One is half exfoliated. One panel is half buried in the sand. Unlike Temple Mountain Wash and Buckhorn Wash, there are no developed roadways leading to these sites. One of the best of the Barrier Canyon anthropomorphs is found in North Wash, below the Hog Spring rest area along the highway from Hanksville to Hite's Crossing. I have heard this figure referred to as the "Moqui Queen." There are only two figures, the anthropomorph and an animal so featureless that its identity is uncertain. This is a very southern occurrence of Barrier Canyon Style. There are another two Barrier Canyon Style sites in the Capital Reef area, one inside the park along Pleasant Creek and another west of the park and south of Torrey at Fish Creek Cove. 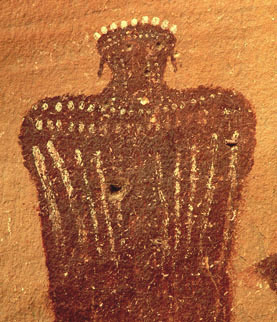 A few Barrier Canyon Style anthropomorphs with square heads are painted along with other art, including circular shields and a row of headless deer or sheep. Petroglyphs occur also. Though not a comprehensive review of all Barrier Canyon site west of the rivers, this page provides a sampling of some of the best of these panels. The next Barrier Canyon Style page covers sites east of the Colorado-Green confluence and outside of Canyonlands National Park. Select the NEXT button to continue. Your comments, etc. are appreciated. Inquiries welcomed.